Houston Shines in First Year with Katrina Evacuees Much of the city of New Orleans, perhaps two-thirds of its population, evacuated to Houston when Hurricane Katrina struck. The Texas city received many New Orleans residents who didn't get out until after the levees broke. Horrified by the rescue effort, Houston embraced its forlorn neighbors. 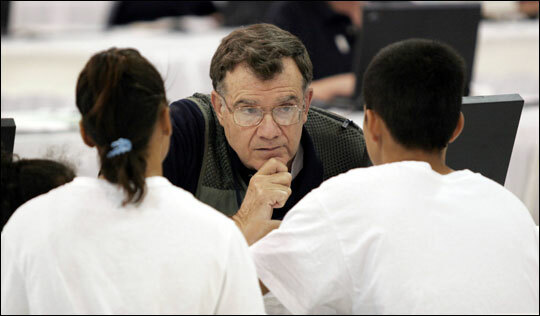 Federal Emergency Management Agency agent George Carney, of Oklahoma City, helps register hurricane Katrina evacuees at the Greater Houston Area Disaster Recovery Center on Sept. 20, 2005. 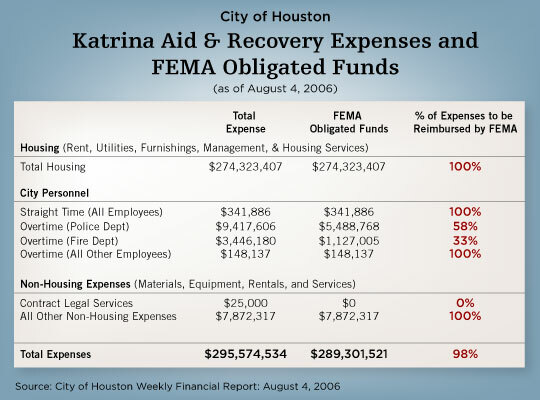 The city of Houston expects that FEMA will cover 98 percent of its Katrina-related spending, almost $290 million. 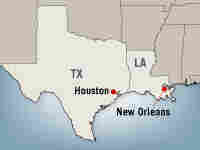 Houston is 325 miles to the west of New Orleans. The two cities are directly connected by the I-10 highway. 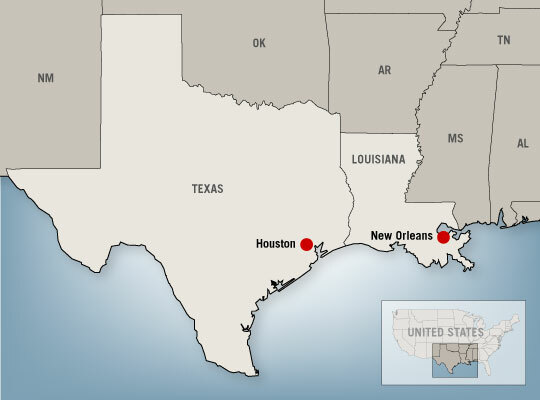 Much of the city of New Orleans, perhaps two-thirds of its population, evacuated to Houston when Hurricane Katrina struck. The Texas city received many New Orleans residents who didn't get out until after the levees broke. Horrified by the rescue effort, Houston embraced its forlorn neighbors. It moved them into 35,000 vacant apartments, despite the Federal Emergency Management Agency's (FEMA) reluctance to approve payment for that type of housing. The results were dramatic. Houston spent a fraction of what FEMA spent to house evacuees in hotels and trailers in Mississippi and Alabama. More than 111,000 New Orleanians are still in Houston a year after Hurricane Katrina. Nearly 250,000 Katrina evacuees now live in Texas. Almost 60 percent are jobless and 40 percent of the households are getting by on less than $500 a month. Eighty-one percent of the evacuees are black. School districts in the Houston region quickly ran up million-dollar tabs by taking in at least 21,000 elementary, middle and high school students from New Orleans. Once absorbed, the Katrina students did poorly on Texas' essential skills testing. School districts recognized the problem and began to offer after-school and summer tutorials for the students whoe were not up to speed. Of all of the city institutions which have had to react to the tragedy -- schools, housing, health and medical services -- the Houston Police Department has had to make the biggest stretch. In the months after the evacuees were settled, the city's murder rate jumped dramatically. The department reacted by instituting mandatory overtime for patrol officers, clocking $1 million a month in extra pay. Houston has asked the federal government for the money to hire 400 more police officers. The precincts where Katrina survivors concentrated in Houston reduced some patrol beats to individual apartment complexes. The intense concentration of officers to trouble spots appears to be working, as the murder rate has begun to come back down. 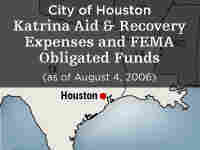 Up to now, the vast majority of the Katrina evacuees in Houston have been supported by money from the federal government. In addition to rent money, the government has extended Medicaid coverage. For many evacuees, it's the first time they've ever had health insurance. But the clock is ticking on these benefits. Beginning Aug. 31, the first 5,000 households of Katrina evacuees in Houston are scheduled to lose their FEMA assistance. An additional 20,000 families are scheduled to lose their checks Oct. 31. All evacuees lose their FEMA benefits by February, one way or the other. Houston's political, business and religious leaders are worried about what is going to happen afterward. The first chapter of the Katrina evacuees' story in Houston is a tale of generosity, brilliant organizing and inspired local government. But the city is about to turn the page. The second chapter of the Louisiana diaspora and the great Texas city is likely to be a much darker drama.